I’ve had an Instagram account for 5 years but until last year I’ve not posted my work. Yesterday I posted my 406th shot, so I figure I will show my top ten here. My Instagram. One of the top uses for Instagram photography is to promote smart phone photography. And there are some unwritten rules. However rules are made to be broken and I broke them all. I chose to post a new post every day but not necessarily made by my phone or created and posted at the same time. Only one selfy shot 5 years ago, to test out this new photo app. I started by cropping every image square but soon found it wildly restricting. So now I just post the best image I can. Here are my top 10 images, by number of likes and the messages that accompany the images. Most are cropped to fit the square format. These at one time or another were my top liked post on Instagram. 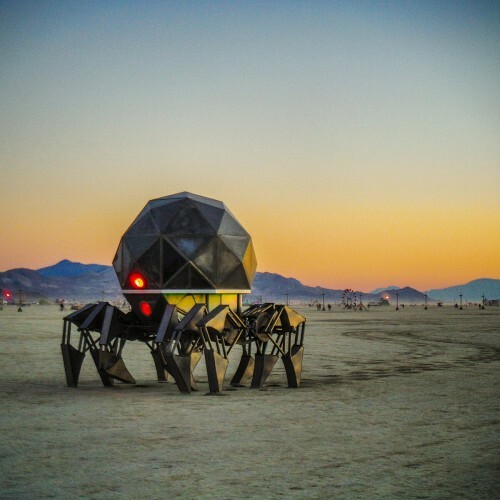 The Walking Pod by Tin Man inspired by Theo Jansen is such an incredible work of art! Yes it actually walks! See it’s tracks in the picture. 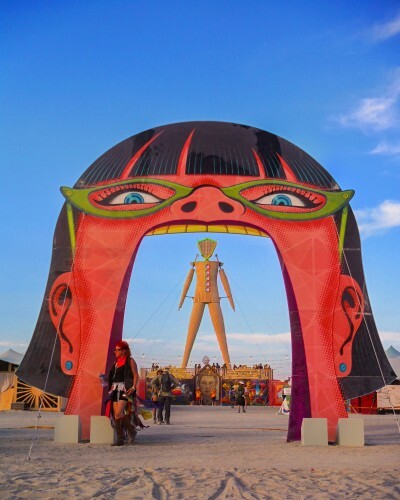 I arrived early In the morning to find it in place on the playa. I loved the glowing red light. It looked alien like a half robot creature. Actually it’s a full tent/camp that can walk around with sleeping quarters inside. How cool is that!!? I love the art and the maker creativity that’s out there. 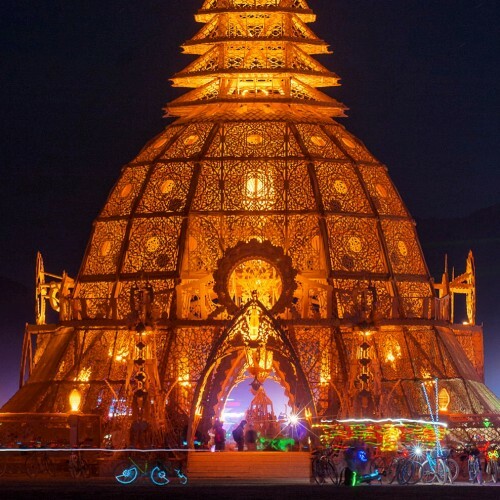 Tin Man or Scott Parenteau has won numerous Maker and architectural awards for his unique dwellings including the Golden Rebar Grand Prize Award at Burning Man. See some more of his work Here. 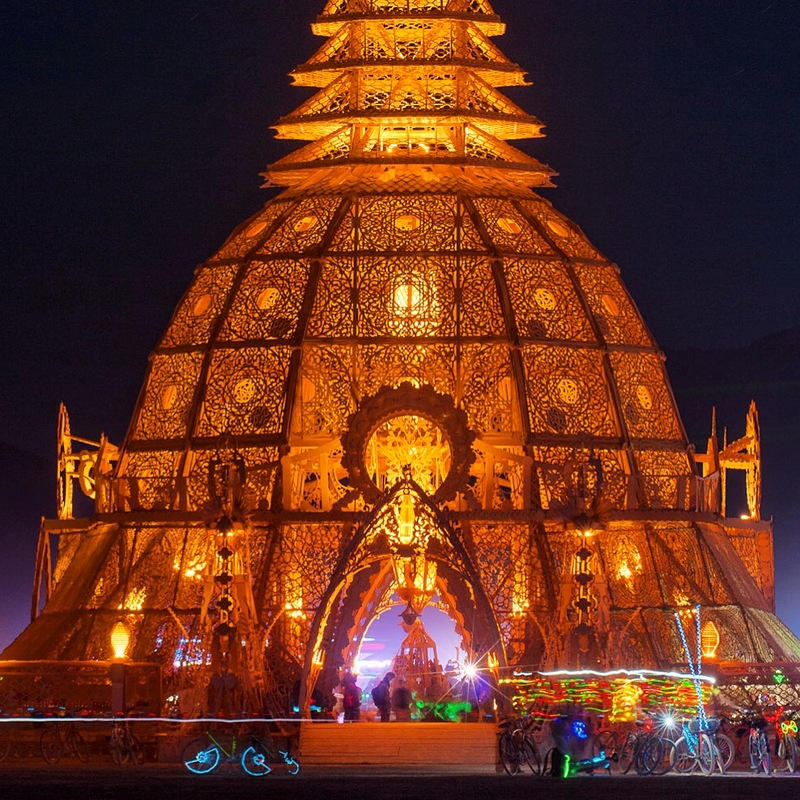 If you can imagine it, make it, and bring it out to Burning Man, do it. David Best Temple Of Grace. Beautiful and burning gracefully, falling with a lovely spin of the frame. The temple is the place to reflect upon people, moments, and opportunities lost. To cry, to meditate, to forgive and let it go. There is no right or wrong, just respect the space for others. I’m glad we have the temple. Temporary as life and all art is. We are just specs on the time line of the universe. Once you reflect on that, you can smile, love and live life and not take it all so seriously. 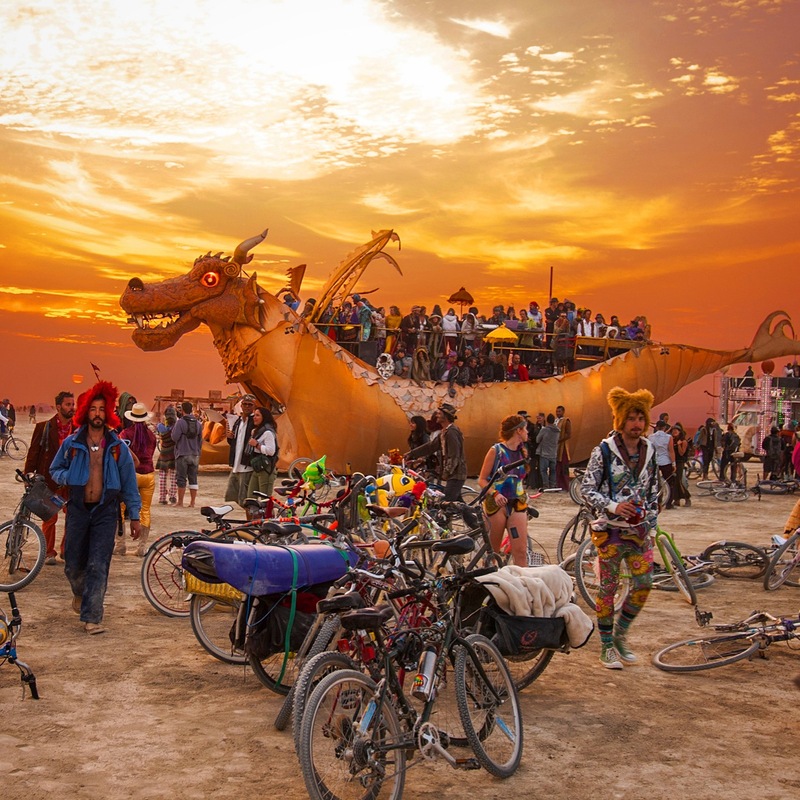 Abraxas Dragon At Sunrise, I like this shot! 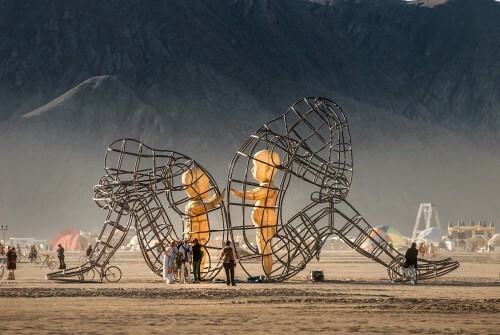 People joined to watch Burning Man’s first morning burn Embrace. They came to join the circle from every direction. Some on foot, some biked to later drop them in giant bike islands, and others in large mutant vehicle shuttles like Abraxas Dragon. The shot really gets the flavor of a morning. People, bikes, and art cars everywhere while an amazing sunrise takes place. I like the full mutant vehicle with tons of people aboard watching the sun rise, as two guys with playful hats walk towards the camera amongst the bikes. These three points of interest keeps my eye moving around the shot and brings me into the morning playa. 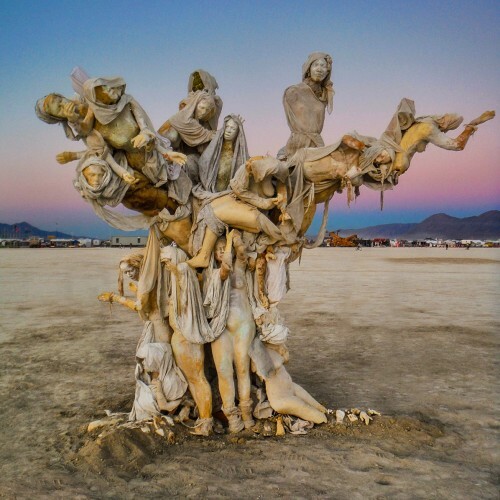 WomenTree by Valerie Mallory. This is the color version of this haunting artwork. 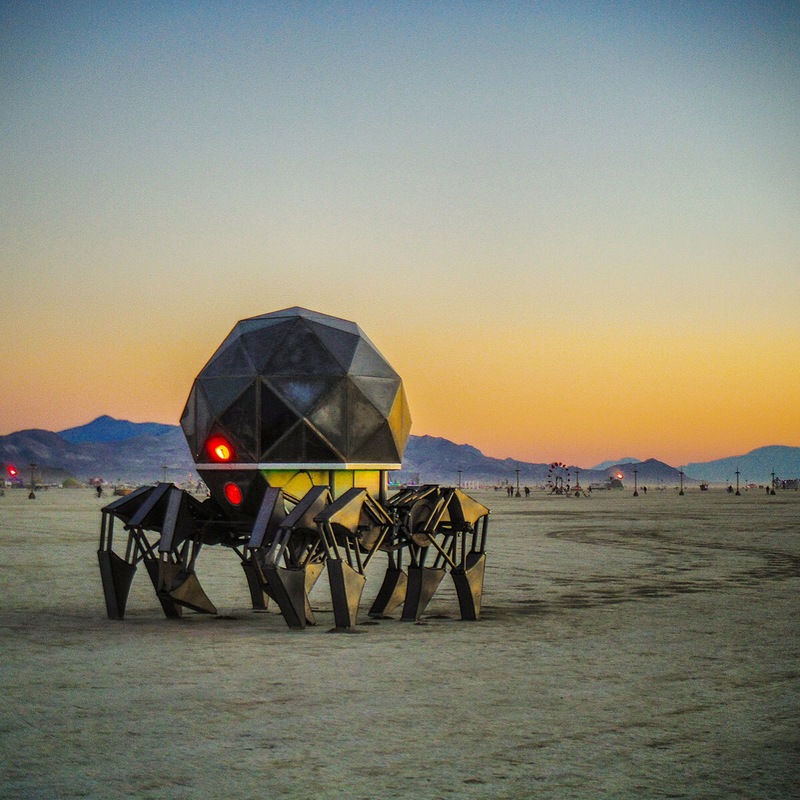 I shot this at Burning Man 2014 early one morning. 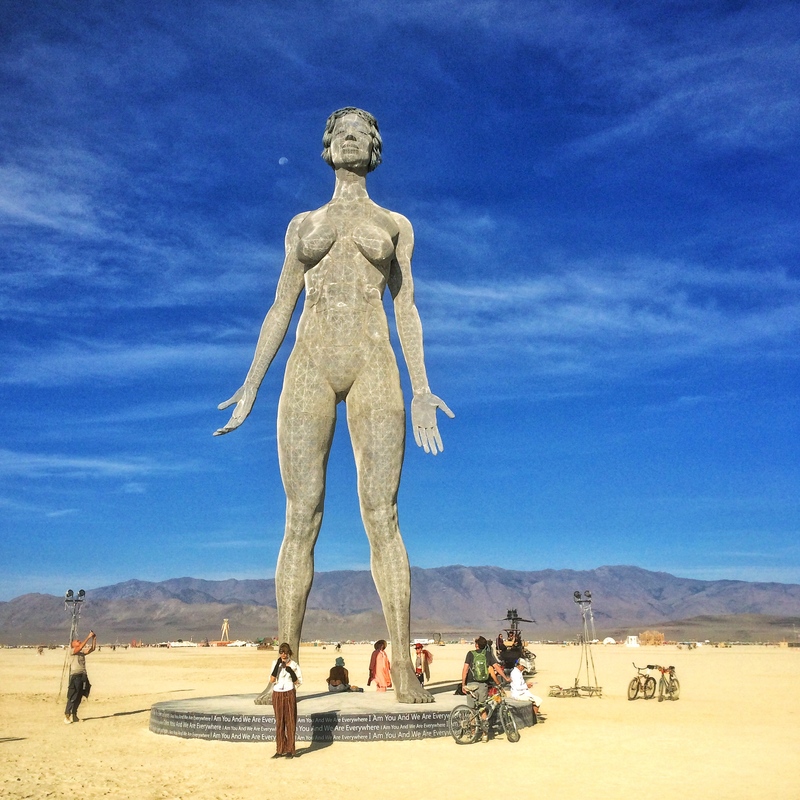 Last Year Valerie Mallory was back with another sculpture called Soul Refuge. The piece was made to look like a crumbling old building from a distance but as one got closer the spirits or souls would be revealed. See pictures of all her Burning Man Sculptures by clicking #womentree on Instagram. 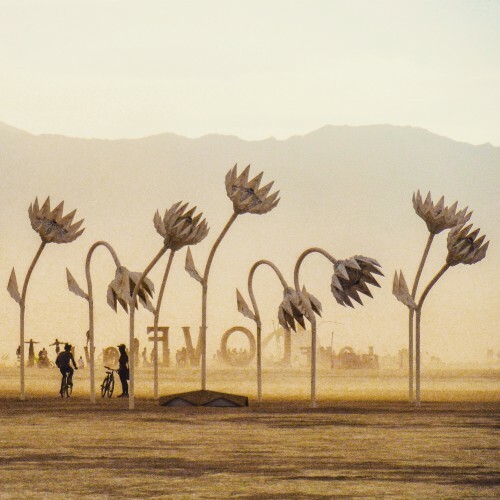 Blumen Lumen by Foldhaus Artist Collective is a collection of flowers, ranging from 10′ to 15′. The buds are primarily constructed from corrugated plastic sheets that have been plastic welded and folded. These tessellated fold pattern creates flower buds that open and close as the flexible stems move gently in the wind. Between and around the stems are “garden stones” constructed from marine plywood with pressure pads on top, treated to look like stones, that sense when people are standing on them. The translucency of the plastic materials allow for an array of vivid, varying diffusions of colored light. Through the use of computer control and sensors, endless patterns of colors and color movement fill the tessellated material as well as the ground space under it. Small speakers mounted within the stems and buds of the piece play ambient and organic sounds based on sensed movement and other programmed events. Electronic control and integration of the sensor array and lighting, sound, and motion, is provided by multiple Arduino (or Raspberry Pi) programmable boards and likely connection to a low-power old laptop computer or tablet computer for on-the-fly changes to the audio and lighting program selection. The Blumen Lumen project seeks to create not just interaction, but an awareness of the importance and influence of one’s own behavior, particularly within a group, on nature and its ability to thrive. Put another way, this piece may reveal to people that the more they ignore nature (such as by physically passing it by quickly), the more nature will ignore them (by not “activating” and providing them with an interactive experience). I’ve seen pictures of these with the flowers lit up but I don’t remember ever seeing it in person. This was one of four or five flower themed installation pieces that made it out there that year. I loved how they looked in the dust. Like a surreal garden deep within the rabbit hole. Not surprising, 2016’s art is mushrooms. Alice would be right at home. It’s funny how serendipity works that artist all make similar works the same year. In 2013 it was chapel or churches. 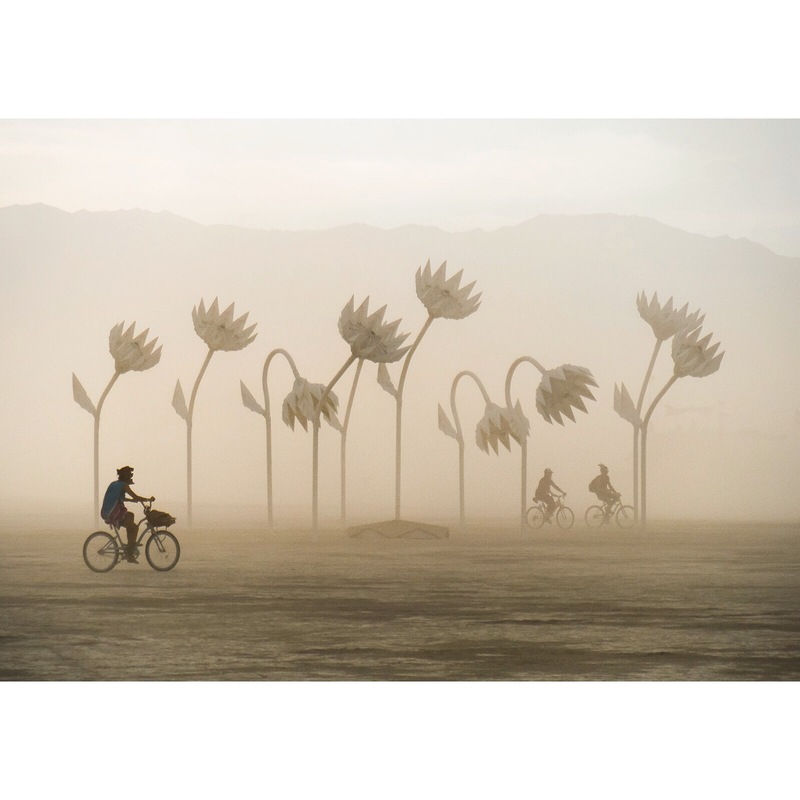 Guy rides past desert flowers of Blumen Lumen. These made it to a bunch of festivals. I think the project is tied to designers at IDEO but not 100% sure just 99%. R-Evolution, Burning Man 2014 by Marco Cochrane is part of a three art piece called the Bliss Project. The whole project is keyed to recognize women and their power beyond the sexual, women beyond the place of object but of life’s source energy. It’s to honor the power women evoke and deserve and to end the abuse of women. Marco Cochrane was back with R-Evolution part of his Bliss Project. First was Bliss Dance, then Truth is Beauty and now this one. All are powerful and beautiful pieces. This was shot with my iPhone. Due to that its not the best file but it was my top liked Instagram picture coming out of 2015. This is my third most popular post to date. I like how the Two sculptures of The Man and R-Evolution mimic each other. To show this I used a telephoto lens and like my most popular image of the Love sculpture nobody knew what I was shooting from far away. 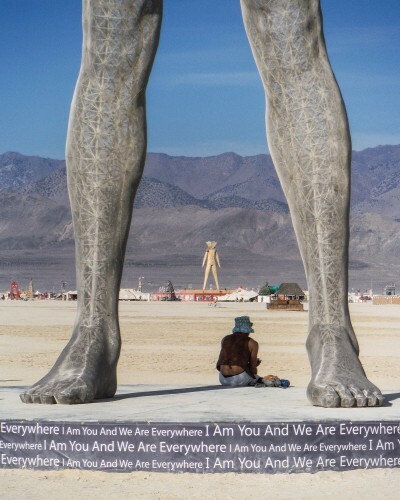 I am you and we are everywhere. 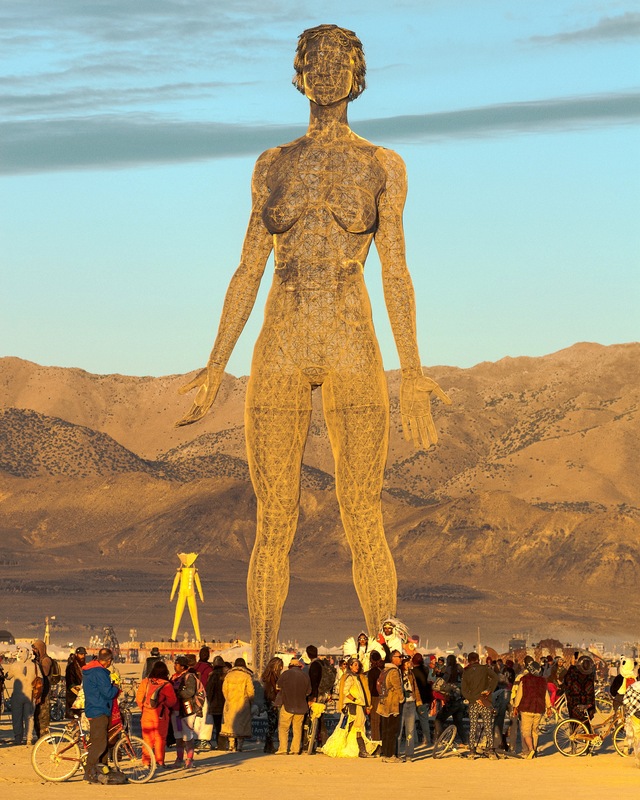 One of the cool things about R-Evolution was the movement of the sculpture. As it stood it, looked perfectly still, but if you got under it you would see that the sculpture breathed! I didn’t notice it but I have seen some footage of it and it blows my mind on how good Marco’s work is. Wow! She Breaths! A Man Got Your Tongue? Burning Man gateway to enter the midway area around the man. This is my second most popular post to date. On the other gates were elephants, and the Devil. I’m not sure if there were three or four midway entrance gates. I guess there were four. This one is Lulu, The “pop music nerd girl”. 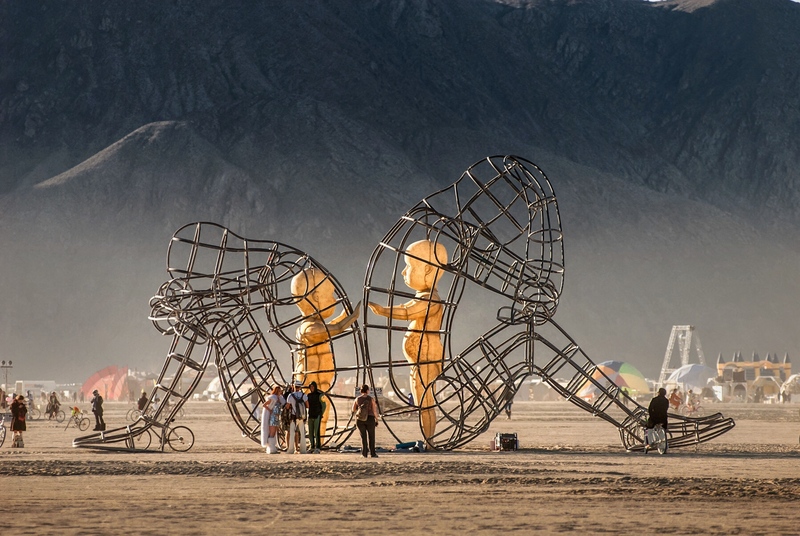 Love sculpture, Burning Man 2015. One of to more powerful pieces there. I loved how the sun hadn’t hit the far mountain yet. The sun was just beginning to hit the mountain so after about ten minutes of waiting for the people to clear I just shot anyhow. With a long telephoto lens I could compress the distant mountains and use the shadow as a dark sky as the light lite up the baby sculptures. I like how it came out. It is the only shot of this great installation art that used such compression as all the shots I see are wide angle. One advantage of shooting wide is your close to the sculpture, if someone is hanging out you can kindly ask them to step aside so you can get a clean shot of the art. But from a hundred yards away that is not possible. I waited but they were not moving. Oh Well! I think it may have been a stronger shot of the art without the people but who knows. Maybe this is the way it was supposed to be. Thanks for checking out some of my work!